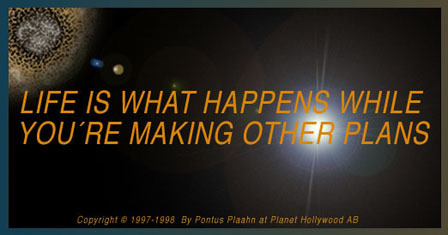 Planet Hollywood AB is a privately held Swedish company doing business since 1994. Planet Hollywood AB is dedicated to providing our customers excellence in programming and design for today and the future. Planet Hollywood AB produces and maintains web pages, e-sites, and computer education for client companies. We can perform on-site system analysis, plan IT-purchases and IT-projecting to meet the needs of both start-ups and growing companies. We supply state-of-the-art solutions to your hardware and software needs with our own brand of CLPP Computer Systems. Our highly skilled technicians can build the correct systems to meet your specific needs. Our machines come supplied with operating systems of your choice and can be loaded with any of the latest software your business needs to be productive. Planet Hollywood AB has also developed and owns the patent on CLPP Systems With Single Sign-On. If you are familiar with the Microsoft application, 'Passport', you may be surprised to discover that the professionals at Planet Hollywood AB had developed and patented a very similar technology long before Passport hit the market. At Planet Hollywood AB, new technologies are constantly evolving. Something that will put Planet Hollywood AB on the map during 2009/2014 will be our latest closely-guarded secret. It’s our "developed behind closed doors in-the-house encrypted system". Our system is right now tested by banks and cc-comanys. All we can tell you right now is that it is based an a 1024-bit technology we call CLPP Systems “BITE ME”. Look for us at INTEROP! Planet Hollywood AB adheres to international rules of copyrights and trademarks. We are in no way affiliated nor have anything in common with the restaurant with the same name operating in other countries outside of Sweden. Copyright © 1994 - 2014 by PLANET HOLLYWOOD AB, 2014. All rights Reserved. CLPP Systems with Single Sign-On are a registrated Trademark.